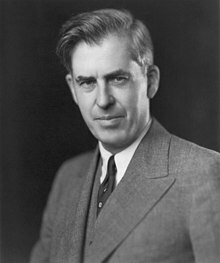 Henry A. Wallace (October 7, 1888 – November 18, 1965) was an American economist and politician. He was the thirty-third Vice President of the United States (1941–45), the eleventh Secretary of Agriculture (1933–40), and the tenth Secretary of Commerce (1945–46). In the 1948 presidential election, Wallace was the nominee of the Progressive Party. If we define an American fascist as one who in case of conflict puts money and power ahead of human beings, then there are undoubtedly several million fascists in the United States. There are probably several hundred thousand if we narrow the definition to include only those who in their search for money and power are ruthless and deceitful. Most American fascists are enthusiastically supporting the war effort. "The Danger of American Fascism," in New York Times, April 9, 1944. Quoted in: Democracy Reborn (New York, 1944) p. 259. My first introduction to economics came by way of Professor B.H. Hibbard. I remember being asked in 1910, at the close of my college course, who had influenced me most, and I said Professor Hibbard. Later, of course, we came to disagree violently about the McNary-Haugen Bill and some other things; but I still think that Professor Hibbard is a very good teacher. Henry Agard Wallace (1973), Democracy reborn, p. 96; cited in: Gerard F. Vaaughn, "Benjamin H. Hibbard: Scholar for Policy Making," in Choices, First Quarter 1998, p. 38. This page was last edited on 29 August 2018, at 06:43.